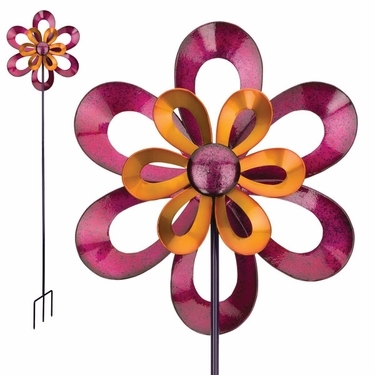 Spin motion and fun directly into your flower garden with the youthful charm of our new 19" Infinity Wind Spinner! All metal in design, constructed with stainless-steel ball bearings so even the gentlest breeze will make the leaves on this metal sunflower spin around with whimsical joy. Firm 3-prong pitch stake bottom for extra stability.